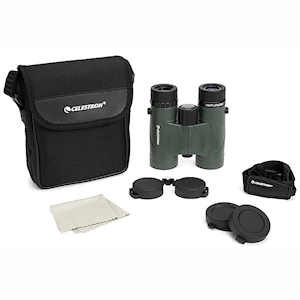 Celestron Nature DX 8x32 binoculars are inexpensive roof prism binoculars designed for the beginning nature enthusiast. 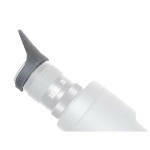 Nature DX binoculars, while not costly, still offer surprisingly excellent optical performance. The 8x32 Nature DX is compact, weighing just 18.0 ounces, while offering more light gathering capacity than a true compact binocular. 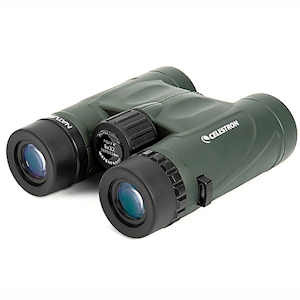 Celestron Nature DX binoculars are made with fully multi-coated lenses, phase-corrected BaK-4 glass prisms, durable shock-proof armor, and fully waterproof and fog-proof frames. 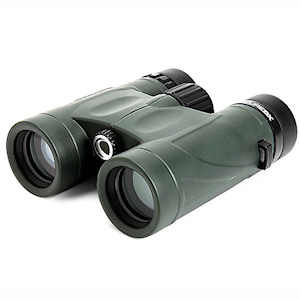 The 8x32 Nature DX binocular has a large 388-foot field of view at 1000 yards and close focuses to just 6.5 feet! This is big performance indeed in a 32-mm binocular! Field of View: 388 ft. at 1000 yds. Dimensions: 5 x 4.9 x 1.8 in.